When we discuss satellite temperature measurements, we need to remember that it is usually lower troposphere we are talking about, TLT (Temperature Lower Troposphere). This covers the atmosphere from the surface up to around 10000 feet. But the middle troposphere is just as important. This is the layer that covers from around 10000 to 30000 feet, as NOAA explains. The measurements are surprising, because computer simulations of the world’s climate predict that the two lowest layers of the atmosphere — which together form the "troposphere" — should be warming faster than the Earth’s surface. And if we check out RSS, we find that the temperature pause is obviously apparent in the TMT, or middle troposphere, just as it is in the TLT. We know that Roy Spencer and John Christy of UAH are constantly vilified by the warmist establishment for daring to produce figures that undermine claims of “hottest years evah”. For some reason, the usual suspects never criticise RSS, which is run by Kevin Trenberth’s big buddy, Carl Mears. But even more remarkable is the fact that temperatures for the middle troposphere are also provided by NOAA themselves, via their Center for Satellite Applications and Research, or NOAA Star. And what do their figures show? 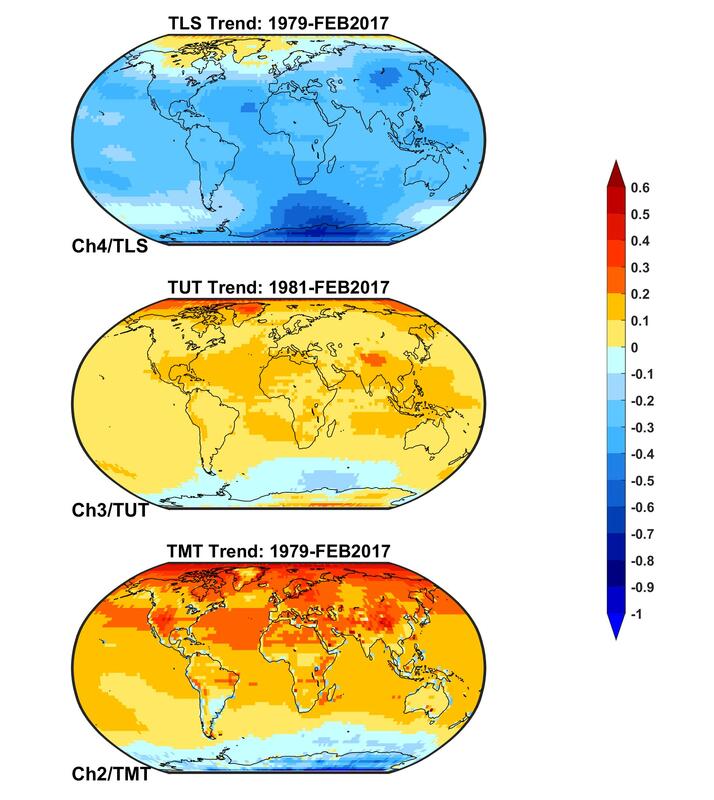 Sure enough, the TMT anomaly confirms that 2015 was not as warm as either 1998 or 2010. Indeed, as the joint NOAA/NASA presentation last week showed, according to STAR, last year was only 5th warmest since 1979. As with the TLT figures, the full effect of the current El NIno is not yet fully reflected in the TMT data, and we must wait a few months to get a true reflection. But it is incredible, and extremely damning, that NOAA are happy to ignore UAH and RSS data when their own data says exactly the same. In the meantime, when some low life from the Guardian or SKS attacks the reputation and motives of Spencer and Christie, point them to NOAA’s own numbers. ← Where Did Ed’s Green Jobs Go? An admission from the great man himself ….. They are in denial it seems. 2015: record hot or not? I have a post on this exact topic today. Also got a good vid of Gavin Schmidt and Roy Spencer being interviewed. Ewan Mearns has posted a thoughtful analysis of the temperature data. It seems that there is an on-going debate is over fractions of a degree in a crude average value. The long term temperature rise from the 1850s is about 0.6 – 0.7 deg K /century which might not even be linear, to complicate temperature-based assessments of AGW. If we assume that the cooling of the LIA was systematic over the world and the heat flux from the sun increased, the earth’s temperature would rise exponentially not linearly and the high albedo of the extra ice would slow the recovery. Unfortunately, the measurements become vaguer as one goes back in time allowing facts to be played with by the unscrupulous. A simple historical examination shows that the statements about the Armaggedon effect of a 2 – 4 deg K rise after industrialisation are clearly junk-science based on half-baked models. 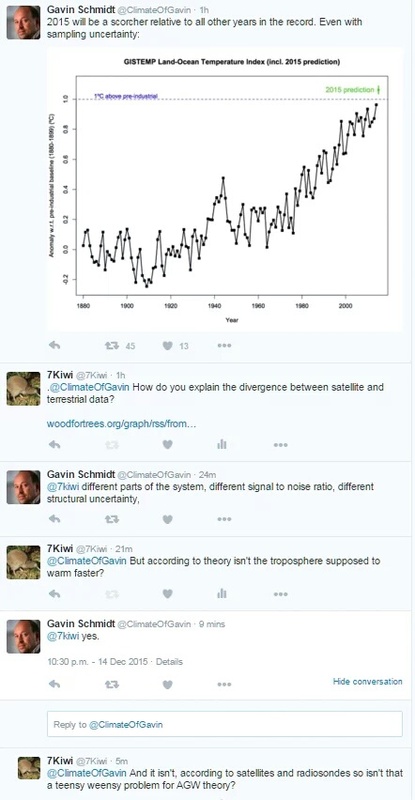 As one who has only a limited understanding of the temperature debate (very confused about homogenisation and precision), how do “warmists” explain the fastest temperature-rise decade ever of 1930 – 1940 shown in Gavin’s graphs above, and of course the subsequent fall back. Gavins graph (ignoring homogenisation) would seem to show an approximately linear heating of 1 deg K per century from 1900 – 2000 if one ignores “noise”, or am I missing something? My own suspicion is that it all reflects weather rather than climate: climate being weather over an undefined period, but this does not seem to deter the fantasists who want to cultivate fear and alarm. With NOAA who ya gonna believe? Their lies or their own “lying” data? I pick Dr. Roy Spencer UAH every time. Book, ‘The Deliberate Corruption of Climate Science’. The troposphere temperature goes up in steps coinciding with El Ninos. The stratosphere cools when the troposphere temperature rises. What is happening after an El Nino to stop the heat escaping into the stratosphere? They add some additional insight to the time series you showed. It appears that in the mid/upper troposphere, the northern hemisphere is warming and the southern hemisphere is cooling (or at least not nearly warming as much). Is this consistent with the theory that the troposphere is warming because of CO2? If not, there must be something else causing these huge temperature differences. Thanks, Paul. The NOAA STAR data clearly shows the opposite of what NCEI is telling us. There is a pause in the global temperatures, CO2 continues to rise; ergo, CO2 is not in control of global temperatures. I fantasize about a new R. president appointing new agency heads with a mandate to identify and reverse the fudging from the last decades, with instructions to terminate foot-draggers. Hi Paul, here’s the climate bet between Pierre and Rob and their teams updated to December 2015. The half way mark. Based on the average of UAH and RSS this decade is running a teeny weeny bit cooler than the previous. Though I reckon the El Niño might make the lines cross over in a few months time. http://www.kiwithinker.com/climate-bet/ It’s a close race indeed. Outstanding post from Paul Homewood describing NASA’s own satellite data.